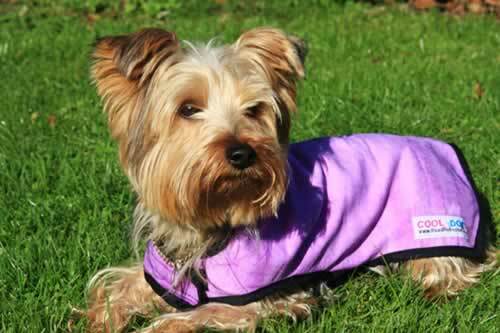 When it is hot outside, the Extra Small Prestige Cool-Coat will keep your dog cool and refreshed for hours. Prestige Cool-Coats are activated by water, they are light, cool and soft to the touch, making them luxurious and comfortable for your dog to wear. 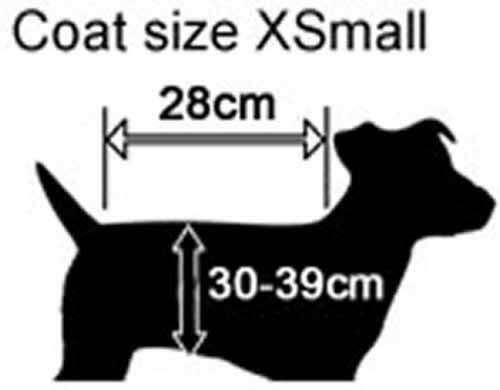 The Cool Coat will make your dog feel cool, but not wet (you can test this by putting your hand beneath the dog's coat and feeling how cool he feels compared to any part of his coat that is exposed to the sun or heat for a period of time). As the heat of the day slowly evaporates the moisture from the Cool-Coat, this in turn draws the heat out of the dogs body, leaving them feeling far cooler than before. When the Cool-Coat coat starts to dry out, it will begin to go back to its natural state, becoming slightly dryer, and a little stiff. When this happens, simply reactivate your coat by putting it in water for just a couple of minutes. Once the Cool Coat is completely saturated, remove the coat and squeeze out the excess water, so it feels cool, yet not wet and pop it back on our dog. Cool-Coats are made from 100% synthetic material, they are simple to use, wash and store. Please Note: Please allow up to 7 days to receive this product.